Singer to the Sea God is a fun take on the traditional Perseus myth. Perseus is here cast in a minor, rather villainous role, and as such his story takes a back seat to the tale of Pheidon, Uncle Pelops, and two other slaves, who escape the petrifaction of King Polydectes and his court after exposure to the Gorgon’s severed head. Read the rest of the review. The pacing is good and the book is short, so that really motivated me to finish it in one go. The plot wasn't really what I expected based on the title and the cover and the first chapter, which was a little disappointing because it's not as epic as it tries to build up to be. However, it's still a good story, and it wraps everything up neatly in a nice little bow at the end, though the end isn't really all that satisfying. 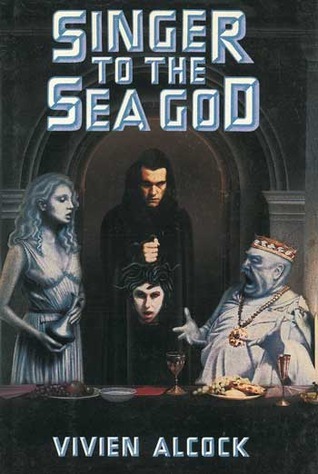 Back in the 90s, before YA fantasy became popular, this was one of the only YA Greek-myth fantasy books widely available. It's a fun read with a solid story. It may not be as sophisticated in its design and feel as Rick Riordan's Olympian series, but it's still worth a read! I remember really enjoying this book when I was younger. It was the one that got me into reading. I really enjoyed the storyline, the setting, the characters...It is definitely on my to-read-again list. Vivien Alcock - Born September 23, 1924, in Worthing, Sussex, England; died October 11, 2003, in London, England. Author. Alcock was a bestselling author of mystery and fantasy fiction for young adults. Her early training and career, however, was in commercial art, and she attended the Ruskin School of Drawing and Fine Arts from 1940 to 1942. She left school to become an ambulance driver for the Auxiliary Territorial Service during World War II; after the war, she held several different jobs, including as an artist for the duplicating firm Gestetner Ltd. from 1947 to 1953. This was followed by three years as an employment bureau manager; and from 1956 to 1964 Alcock worked as a secretary for Whiltington Hospital in London. Although she had enjoyed storytelling and novels since she was a child, Alcock was shy about trying to be a published author and was content to stay in the background behind her famous author husband, Leon Garfield. However, she did occasionally give him ideas for his books, such as the popular Smith stories. It was not until 1980, therefore, that she finally published her first novel for teenagers, The Haunting of Cassie Palmer. Alcock continued writing fantasies, ghost stories, and mysteries through 2001, many of which proved popular with teens and some of which were adapted to television as movies and series. She published almost two dozen books in all, including Travelers by Night (1983), The Cuckoo Sister (1985), The Monster Garden (1988), A Kind of Thief (1992), Time Wreck (1996), A Gift on a String (1998), Ticket to Heaven (2000), and her last book, The Boy Who Swallowed a Ghost (2001). Several of her novels were named notable books by the American Library Association (ALA), and The Monster Garden was named the best science fiction/fantasy book of 1988 by the ALA.